RAMAGE, JOHN, miniaturist and goldsmith; b. c. 1748 in Dublin (Republic of Ireland); d. 24 Oct. 1802 in Montreal, Lower Canada. John Ramage entered the school of the Dublin Society of Artists in 1763. By 1772 he was in Halifax, N.S., where he was sued for small debts that year and in 1774. At Boston, Mass., in 1775, he was painting miniatures on ivory, a popular portrait form of the time. That December, some six months after Bunker Hill, he was a member of the Loyal Irish Volunteers, which was charged with patrolling the streets at night; he joined the British evacuation to Halifax on 17 March 1776. Nine days prior to his departure from Boston, Ramage had married Victoria Ball. According to the Reverend Mather Byles of Halifax, he left Victoria in Boston and by March 1777 had married a Mrs Taylor, whose identity remains a mystery. It has been stated by Walter George Strickland, in a work published in 1913, that Ramage contracted a marriage with a woman whose maiden name was Elizabeth Liddel. It may be that this woman was Mrs Taylor. But the date of the marriage to Elizabeth is uncertain. 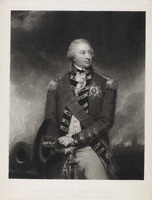 Strickland affirmed that it occurred before Ramage left Dublin and that Elizabeth died in 1784. If Strickland is right, Ramage was guilty of double bigamy in marrying Mrs Taylor in Halifax. Be that as it may, Victoria, who followed Ramage to Halifax, obtained a divorce and returned to Boston. Ramage left Halifax before mid June 1777 “to avoid the further Pursuits of the Law,” according to Byles, and went to New York. In 1780 he was a second lieutenant in the City Militia. 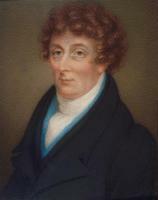 A contemporary historian of art, William Dunlap, described him at about this time as “a handsome man of the middle size, with an intelligent countenance and lively eye.” He dressed like a beau in scarlet coat, embroidered silk waistcoat, black satin breeches, silver-buckled shoes, and a cocked hat atop his powdered hair. In 1787, however, Dunlap noted that he was “evidently declining through fast living.” On 29 January of that year Ramage was married yet again, to Catharine Collins; at the time he had two children by his marriage with Elizabeth Liddel, and he and Catharine were to have three more. 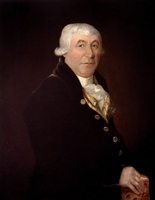 Ramage apparently enjoyed success as a miniaturist at New York; according to Dunlap, he painted “all the military heroes or beaux of the garrison, and all the belles of the place.” The leading families sat for him, as did the president of the new republic, George Washington, in October 1789. Ramage also made occasional life-size portraits in crayon or pastel. Prior to his imprisonment Ramage had planned to proceed to Quebec, of which town he had “the greatest Expectation.” There he hoped to find encouragement from Lieutenant-Colonel George Beckwith and an old Boston acquaintance, Thomas Aston Coffin, civil secretary and controller of public accounts of Lower Canada. Whether he went or not, his financial situation apparently continued to prevent him from sending money to his wife. In 1795 he claimed that, although he had painted several pictures since his arrival (among the best he had ever executed, he added), he had been paid for only two. In February 1796 he wrote of having done “Some very Extraordinary pictures Lately Sutch as was never Seen in Montreal before.” However, as their long separation continued, and as she still received little money, Catharine began to entertain suspicions of Ramage’s sincerity. In November 1797 he protested “Some things in your Letters that racks my very soul.” “Want of money has been the only thing that has Prevented me from flying to your Arms,” he assured her, “as I have never been three weeks at a time in health Since I came to this Place, by my fretting and anxiety of mind for you and my Poor dear Children.” In January 1802 he willed his entire estate to his wife and children. They seem never to have rejoined him. Towards the end of his life Ramage may have obtained some patronage from the family circle of the Montreal merchant James McGill. 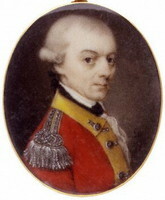 A miniature of McGill has been attributed to him. Moreover, the artist’s death in October 1802 occurred in the home of one Desrivières, perhaps a son or relative by marriage of McGill’s wife, Charlotte Trottier Desrivières, née Guillimin. However, Ramage’s exile among a population he disdained apparently remained friendless to the end: his burial record was signed only by the rector, clerk, and sexton of Christ Church. Typical of Ramage’s fortunes was the fate of a land petition he had submitted in February 1802: he was allowed 700 acres of land in Kilkenny Township, but the grant came a few days after his death; moreover, the township was not erected until 30 years later, by which time the allocation had been forgotten. PAC, RG 1, L3L: 1668, 1772, 5232–63, 58084–91, 79408–15. W. G. Strickland, A dictionary of Irish artists . . . (2v., Dublin and London, 1913), 2: 272–73. R. M. Rosenfeld, “Miniatures and silhouettes in Montreal, 1760–1860” (ma thesis, Concordia Univ., Montreal, 1981). 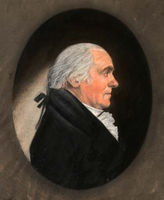 H. B. Wehle and Theodore Bolton, American miniatures, 1730–1850 . . . & a biographical dictionary of the artists (Garden City, N.Y., 1927; repr. New York, 1970). R. H. Hubbard, “RAMAGE, JOHN,” in Dictionary of Canadian Biography, vol. 5, University of Toronto/Université Laval, 2003–, accessed April 26, 2019, http://www.biographi.ca/en/bio/ramage_john_5E.html.